True fellowship in the life of faith is a treasure chest filled with joys. When we find it in books or in persons, it’s worth celebrating with the best things we can bring to the table. That’s why I paired The Wilderness Journal: 365 Days with the Philokalia by Angela Doll Carlson with Tealyra’s Imperial Golden Monkey Yunnan black tea. This tea is smooth and a little malty, perfect on its own. If you want to experience a companionable tea, this is the one to splurge on. Drink it hot or warm with no additions. I steep it a bit strong sometimes, but this tea is perfect with a lower proportion of leaves in the pot. What could be better on a trip to the shore than warm tea, The Wilderness Journal, and honeycomb to sweeten the salt air? As for the book, it makes the company and good advice of the saints accessible in perfectly paired reflections and quotes from the Philokalia. It’s arranged by date, so you can jump in at any point. These reflections bring immediacy of experience to the words from wise men of earlier centuries, inviting us to enter the unvarnished, impartial, but particular and close grace of God right where we are. Each section of the book begins with an introduction to help familiarize readers with some of the context of the excerpts from the Philokalia. Full disclosure: I wrote the brief introduction on St. John of Karpathos for the month of December. I highly recommend this book to tuck into your commuting bag, to sit on the seat beside you for moments waiting on your carpool members, to read in the morning or evening by your bed, or to take with you to the mountains or the sea. I brought the icon. My mother picked the sturdy sea shore flowers. My daughter collected the shells. Looking at this photo, I can taste the salt and the relief of tea and lovely words on the edge of the world. Amazon Shopping List: Imperial Golden Monkey Yunnan tea, The Wilderness Journal: 365 Days with the Philokalia, Folklore Enamel Mug, Folklore Enamel Coffee Pot. I had the privilege to discover that Mother Melania of the Holy Assumption Monastery has two biblical picture books in verse for free today on Kindle. Moses and the Burning Bush and The Three Holy Youths in the Furnace feature the Bible stories and their meaning in church tradition in straightforward, clear verse. Don’t let the idea of verse put you off reading these. There’s nothing cloying in the rhymes. They’re more like reading Shakespeare than the kids’ books that we all dread with forced meters. Along with the simple and readable poem stories, the bright watercolors bring the feeling of the bright joy of God’s surprising love to the eyes. I read these to myself and couldn’t help but read aloud, which drew a flock of children near to listen. They pointed to the photos and asked questions and said, “Oh, wow!” a few times. I highly recommend these books to anyone curious about the ancient Christian tradition surrounding these pivotal stories, and especially for Orthodox and Catholic Christians and inquirers. They’re perfect Lenten reading for families or for adults who love beauty and want a quick read. They’ll stand many re-reads, with new meaning emerging each time. To go with these soul-warming books, make this simple Lenten cocoa. This is an older way to drink chocolate, similar in taste to some of the drinking chocolates in Europe but with the consistency of coffee rather than kefir. Add a heaping teaspoon of cocoa powder to a cup along with a tablespoon (or two) of maple syrup. Stir in hot water from the kettle until you have a drink that looks like medium roast coffee. Enjoy hot. The flavor is bright and soothing. Amazon shopping list (affiliate links): Moses and the Burning Bush, The Three Holy Youths in the Furnace, Guittard Cocoa Rouge Cocoa Powder, Organic Maple Syrup, double-wall stainless steel mugs. Though I first encountered the letters of St. Ignatius of Antioch in my church history classes in college and graduate school, my strongest memory is the summer course I spent painstakingly translating them from the Greek. Alongside the headaches I developed each day from a combination of my dyslexia and unfamiliarity with some verb tenses, I recall the sweet relief of familiar words. When St. Ignatius mentioned the common language of faith, I could put my slow barbarian mouth around the words at last. It’s that experience that made me treasure the continuity between the New Testament scriptures and the prayers of the Church and the ideas in St. Ignatius’ letters. Perhaps because it was so hard won, my understanding of the letters as representing continuity with tradition is the standard I take into any writings about the letters. In many ways, Fr. Andrew Stephen Damick’s book Bearing God: The Life and Works of St. Ignatius of Antioch the God-Bearer did not disappoint. Especially for Christians unfamiliar with the saint and those trained in thought traditions that value contrasts as teaching points, this book offers a solid grounding in the context and basic meanings of the letters. Fr. Andrew does a great job in pointing out the continuity between the practices in the letters and present day Orthodox Christian worship. Though he does not spend a great deal of time explaining pietas — the religion-drenched culture of the Roman Empire at the time — beyond inviting readers to think of it along the lines of patriotism, he draws a great many helpful connections between the life of St. Ignatius, his letters, and the Christian scriptural language that will be familiar to most of his readers. The only thing I wish there were more of is an assumption of continuity with St. Ignatius’ own received tradition. In a few places, the teaching method of contrast actually obscures meaning. For instance, early Christian martyrs did not understand themselves in opposition to the earlier Maccabean martyrs, but as inheritors of the same courageous faith in the same God (though the Christians saw themselves as recipients of a fuller revelation of God’s nature). That sort of attention to the details of continuity help the reader of the letters to avoid modern pitfalls, such as that of assuming that cowering fear in the face of public death is a certainty. It wasn’t a certainty to the early martyrs or the Maccabean martyrs. While Fr. Andrew points to the courage and does not at all fall into the modern assumptions about suffering, it might have helped his point along to point out some of these continuous traditions. “I am the wheat of God, and let me be ground by the teeth of the wild beasts, that I may be found the pure bread of Christ.” Letter to the Romans, Section 4. In the most iconic passage of the letters – literally rendered in icons of St. Ignatius between two devouring lions – more attention to the continuity of St. Ignatius’ language with the tradition of typology would have taken Fr. Andrew’s explanation from encouraging to sublime. While I have no objection to the direction that Fr. Andrew takes in his well-versed section on the Eucharist, the corrective lessons he draws out for modern Christians leave out one glorious truth that can only be accessed through a turn to Ignatius’ own received tradition. John 12:24 (OSB) Most assuredly, I say to you, unless a grain of wheat falls into the ground and dies, it remains alone; but if it dies, it produces much grain. The feeding of the five thousand from the multiplication of already baked bread. The Lord’s Supper, where He called the bread His own body. If we assume – as I believe we should- that St. Ignatius was continuing the line of received typological tradition and adding to it to show us a truth about martyrdom, here’s what he’s saying: Just as God made the plants to bear seed after their kind, and each plant bears many more seeds like the one from which it grew, and just as the Lord said that He would bring forth many more members after His death, and just as the Lord was able to multiple the wheat even after it had been baked into bread, and just as the Lord was even Himself present in the bread, so I will by my martyrdom become the bread of God, strengthening the Church and multiplying the bread of God even after I am eaten. Martyrdom is the endcap to the seed in Genesis. God creates seeds, grows them, multiplies them even after they are baked, and do not fear! He can even multiply the bread of God after it is eaten. To go with this sturdy and edifying introduction to St. Ignatius, I have chosen one of the few non-wine drinks available in St. Ignatius’ time and place: chamomile tea. I chose it also because it’s a good tea to drink in the evening with your book group as you study this book. The tea has the fragrance of green apples, and a little tea cupful goes a long way. I like to use whole chamomile flowers in a 2-cup pot. Add one handful of dried flowers to a pot. Steep in almost- boiling water for 5 minutes and serve immediately. It’s also good at room temperature when you notice that you forgot to finish your tea as you were reading. Amazon Shopping List: organic chamomile flowers (I use these flowers in sensory bins as well as for teas), Bearing God paperback, small teapot and cups set. I received a free copy of this book in expectation of my honest review. He preferred to be alone with his grief–though he wanted all the world to know about it. Emily pushed open the door and paused to take a deep breath of thoughtful, well-educated air. That air is, of course, in the beautiful and well-outfitted library that serves as the heart of the book. Besides the library, the house that Emily inherits holds other treasures, including cubbies hidden in woodwork and at least one secret passageway. Fans of the genre will understand how these details give one a little flutter. Bonus Language Joy: Though it wasn’t low to begin with, my opinion of the story went up the first time the narration used the word “replete.” Most people these days have either forgotten the word entirely, or they imprecisely substitute “complete” in its place. To go with this high-minded and literate murder mystery, I have chosen Tealyra’s Rosy Earl Grey loose tea. The floral aroma and bitter edge make for an indulgent afternoon pour that pairs well with cream and sugar despite its light liquor. The tea blenders were right to describe this blend as the tea version of rose Turkish Delight, but with a bite to it. I recommend that you brew it with an extra spoon of tea leaves added to the pot and serve with milk or cream and a little sugar in your favorite china cup. Amazon Shopping List: Arsenic With Austen Kindle edition, Tealyra Rosy Earl Grey, a lovely teacup such as this Wedgewood Daisy Story Teacup and Saucer Set. This post contains affiliate links. I did not receive a free copy of this book or any compensation for writing a review. 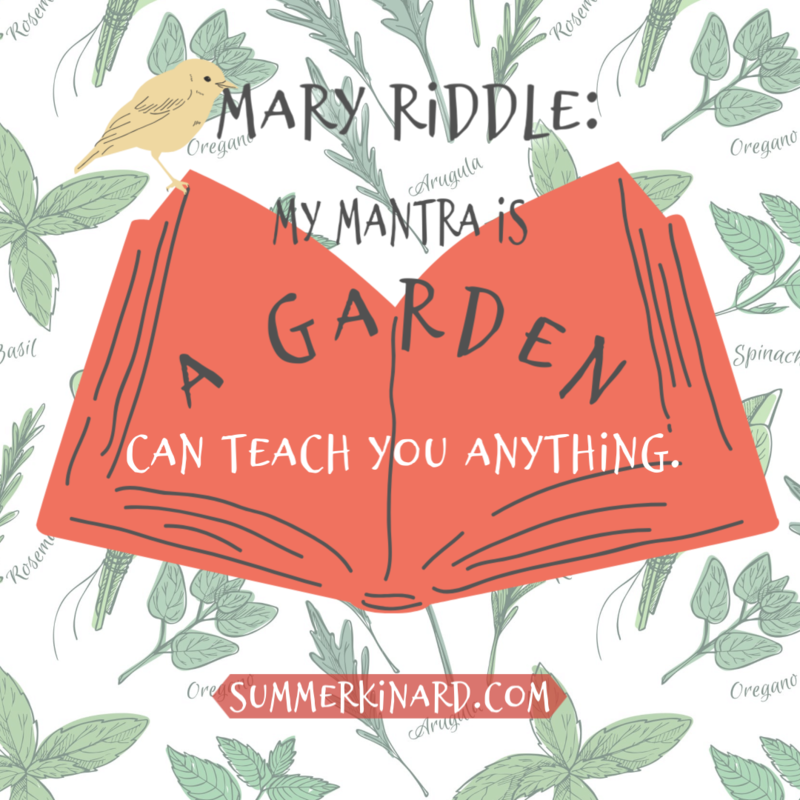 I fell in love with Garden in the East after hearing Angela read an excerpt at a writer’s conference. I bought the book as soon as it came out, but I’m now reviewing it for one reason: This is the kind of book I like to savor. There are certain books that mend the soul and soothe over the damage of self-criticism and the hostilities of the world: Jane Austen novels, Rilke’s poetry, and this book by Angela Doll Carlson. I keep it on my Kindle at the top of the queue, returning again and again to re-read passages. Angela’s background as a personal trainer is evident in her deep awareness of the body. She uses her formidable skills as a poet to weave an engaging prose vision of the body’s graces: organic, dynamic, sacred. This book brought me peace with my body and helped me understand the rich beauty of being created. I highly recommend it for anyone who struggles with their place in the world or who wants to grow deeper into a sense of their sacred selves. A book like this deserves a custom tea blend that focuses on building up the body. I recommend that you make this blend by the pot. You’ll need: rosehips, dried ginger, rooibos, and dried elder berries. Steep in boiling water for 5 or more minutes. The mixture should not get bitter over time like traditional teas. Amazon Shopping List: Garden in the East: The Spiritual Life of the Body paperback, ginger root, elder berries, rosehips, organic rooibos. The Sweetness of Grace pairs well with a soothing and healing tea to enjoy alone or with small groups of friends and family. I recommend Numi Organic Tea Decaf Ginger Lemon Green. I was gifted a free copy of The Sweetness of Grace in exchange for an honest review – several months ago. I started reading it right away and even purchased an additional Kindle copy for myself so that I could read more easily right before bed at night. Why so many months till I reviewed? Because savory books take my speech away for awhile. You know how you can hardly speak for a bit after eating a good meal? That’s how this book affected me. It’s a nourishing book, the sort that will recalibrate your taste in stories, setting a new standard for how you believe the world works. I read and enjoyed The Scent of Holiness a few years ago, and I highly recommend both that and this book that continues Presbytera Constantina Palmer’s collection of and reflection on spiritually upbuilding stories. Like a modern-day Egeria (a 4th C Christian pilgrim whose writings give us a taste of devotion at her time), Pres. 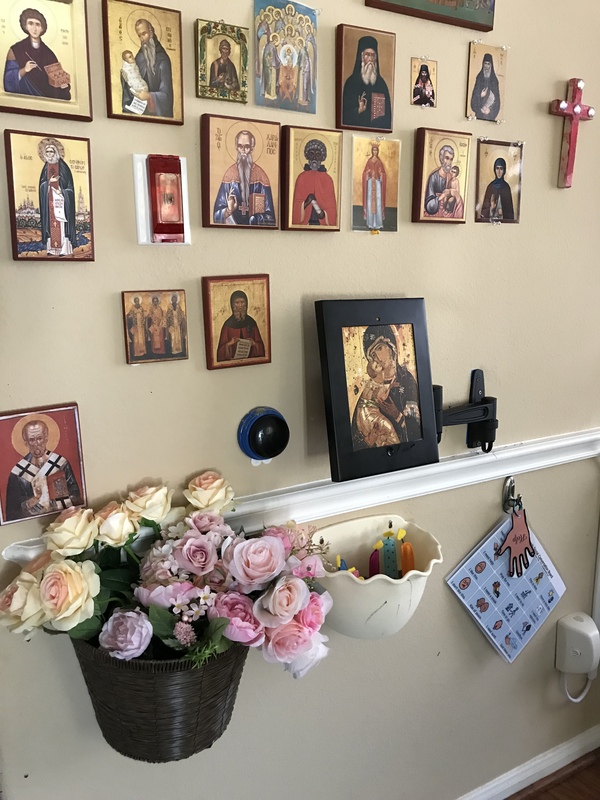 Constantina draws us into the places and lives of holy people well met in monasteries and churches and by God’s grace in all places. I savor her writing because it’s so encouraging and eye-opening. Like rich foods, I want a little at a time, but I want a lot of it! The Sweetness of Grace is a perfect book for reading along with one’s daily scriptures and saints’ lives. It has much in it that could be read aloud to family members for encouragement. The stories are the sort that arise in awed “Guess what?” tones over coffee and dinner tables. I could see it forming the basis of conversation for a busy parents’ group at church; only a few pages are needed to come away feeling built up in the community of faith. For seekers and people discerning and healing, this book is a godsend, as it draws attention to the way God is moving amongst His loved ones. It’s a prophetic work in the sense of building up the people of God and testifying to the great love God has for us — all in accessible, very human stories, engaging real life characters and settings, and well-parsed narration as needed. Get this book to keep by your knitting or in the kitchen while you wait for your tea. (I recommend that you drink it in calm times with a soothing, healing green tea like the Numi decaf Ginger Lemon blend.) Get it for your friends and family. Read a bit to your family. You’ll start to notice more that God is working in your life, too. Amazon Shopping List: The Sweetness of Grace paperback, Numi decaf Ginger Lemon green tea. If you haven’t read it already, add The Scent of Holiness to your shopping list, as well. I’m revamping this blog to post allergy-friendly recipes and tea and book review pairings. Here’s the first pairing, based on a book I read at the beginning of this autumn’s reading binge. I received a free review copy of this book in exchange for an honest review. Some books heal by skirting the edges of pain, but this book dives right into it, bringing us healing through facing the truth. When a Man Loves a Woman by Tumika Cain answers the question a lot of us have from the outside looking in on situations of domestic violence. Many of the reviewers have already provided insights, but I would like to offer the feeling it inspired for me in the form of a tea recipe. This tea, and this book, taste like catharsis. Steep in boiling water for 5 minutes. Serve with brown sugar cubes and maybe a little half and half. The bite of cardamom echoes the sophisticated characters, and it gives a bite to the beautiful life that Alicia lives despite the troubles she endures. The blend of the two reminds us like the book that change does not happen alone. I highly recommend this book to anyone who wants to read a fictional account that brings them to the heart of both pain and healing. Amazon Shopping List: When a Man Loves a Woman paperback, Harney & Sons Decaffinated Earl Grey teabags, Organic cardamom.